Mike Oldfield’s “The Killing Fields” Soundtrack & DVD Limited Edition Deluxe Box Set Now Available For Pre-order! 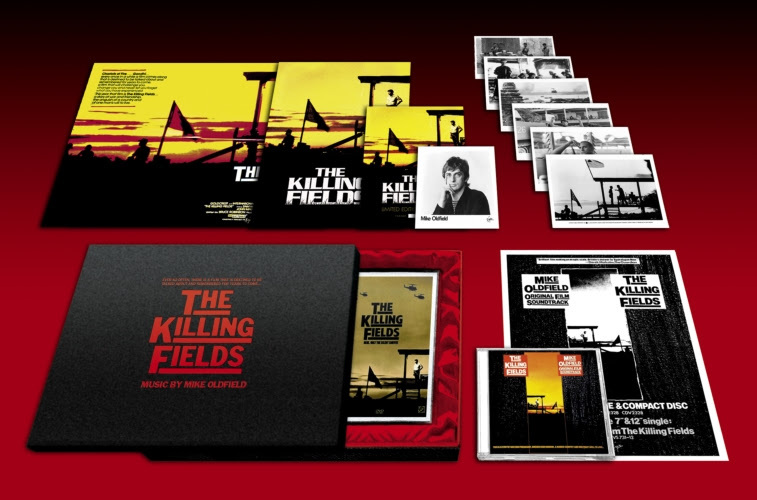 Mike Oldfield’s “The Killing Fields” Soundtrack & DVD Limited Edition Deluxe Box Set is now available for pre-order. “The Killing Fields” is a 1984 British biographical drama film about the Khmer Rouge regime in Cambodia, which is based on the experiences of two journalists: Cambodian Dith Pran and American Sydney Schanberg. It was directed by Roland Joffé and produced by David Puttnam for his company Goldcrest Films. Sam Waterston stars as Schanberg, Haing S. Ngor as Pran, Julian Sands as Jon Swain, and John Malkovich as Al Rockoff. The adaptation for the screen was written by Bruce Robinson; the musical score was written by Mike Oldfield and orchestrated by David Bedford. The film was a success at the box office as well as being an instant hit with critics. At the 57th Academy Awards it received seven Oscar nominations, including Best Picture; it won three, most notably Best Supporting Actor for Haing S. Ngor, who had had no previous acting experience. At the 38th British Academy Film Awards, it won eight BAFTAs, including Best Film and Best Actor in a Leading Role for Ngor. In 1999 the British Film Institute voted “The Killing Fields” the 100th greatest British film of the 20th century. In 2016 British film magazine Empire ranked it number 86 in their list of the 100 best British films. “The Killing Fields” is the 10th record album by Mike Oldfield, originally released in 1984 on Virgin Records. It is the only full-length film score written by Mike Oldfield with the music was orchestrated by David Bedford. Though Oldfield’s music had been used in films before (see “The Exorcist” and “The Space Movie”), this was the first time he had written specifically for film, and so far the only time. Oldfield composed the album on a Fairlight CMI. Like many movies, the album is not a comprehensive record of all the Oldfield soundtrack music used in the film. Most notably, the music accompanying the darkroom sequence does not feature on the album. Oldfield’s work on the score was partially instigated by Virgin boss Richard Branson when he took Oldfield to see David Puttnam, a producer on the film, which then secured him the role. Oldfield spent six months working on the score for “The Killing Fields” before going on tour, but when Oldfield returned, the producers of the film asked for more music to be written, prompting Oldfield to ask for the use of an orchestra and a choir; three months later the score was finished. Mike Oldfield – guitars (Gibson Les Paul Junior and SG Junior), synthesizers (including Sequential Circuits Prophet 5, Oberheim OB-Xa, DMX and Roland VP 330), Fairlight computer, producer, engineer. This deluxe box set brings together both the soundtrack CD and the film DVD for the first time, along with reproduction memorabilia from the film and a numbered certificate. This edition is bound to be a collector’s item for both fans of Mike Oldfield and of the movie alike!